A Quote-Let an expert do it. Dawn was born into slavery and had to fight through the ranks to make it in his life on her home planet. Finding that she had a natural affinity for Computers her master allowed her to be trained in their use and repair and it was during this time that she meet a Chevin male named Domfree and fell in love with him. Knowing that they could never be together while slaves Dawn desperately wanted to free both him and herself. Sometimes destiny takes a hand in matters and it was during an attack by another local family that his Masters house was greatly damaged. Dawn was brought out of the rubble and told that Domfree had been killed. She was beaten horribly by her new masters and sold numerous times over the next two and a half years. During his second year with the Mutt Squad and while on an assignment with Hargoth, Domfree discovered that not only was Dawn alive, but that she was being sold on a slave auction in the streets of El Diablo Mesa. Hargoth and Domfree sprang into action and freed the slaves, but the assignment was blown and Hargoth almost paid for their mistake with his life when he attempted to disarm someone with a thermal detonator. 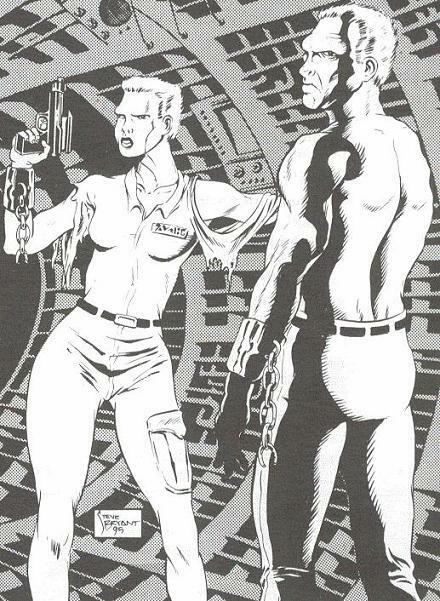 Having been reunited with Domfree, Dawn joined him and operated with the team up until they destroyed the Sparti Clone cylinders on Talmar in the Emperor's secret storehouse. After the battle of Talmar Dawn and Domfree left the Rebellion and were last seen hitchhiking across the Galaxy using an older copy of the 'Hitchhikers Guide to the Galaxy.' to guide them.